My favorite place to be this time of year is sitting in the middle of my future vegetables. 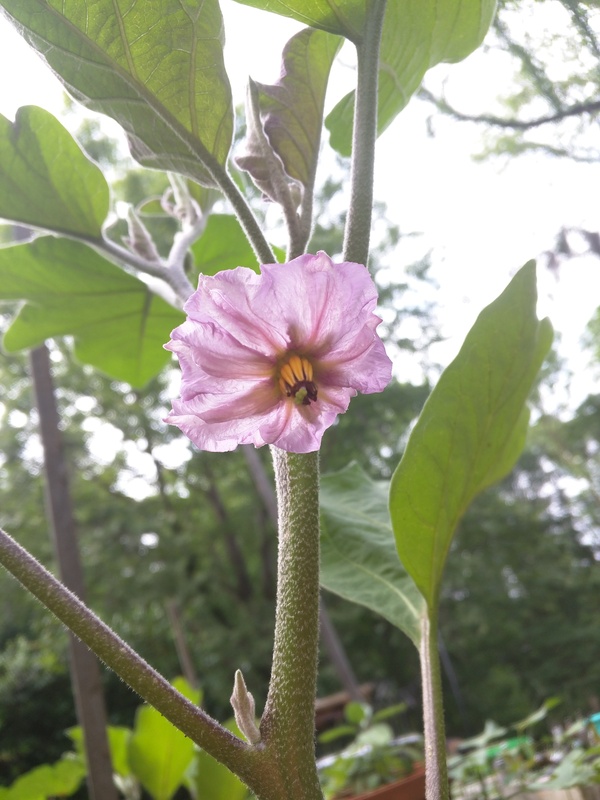 A cat usually wanders up and plops in my lap and I pull up some weeds that have emerged after the last big rain, but mostly I sit and stare at the wide leaves of the eggplant and look up into its lavender flowers as the sun shines through its petals and I think about beauty and bounty and seasons. I count the okra to see if a cat sat on a seedling or one was dug up in the night by some hungry creature who wandered by. The asparagus that has gone to seed tickles me from behind. I can’t quite figure the asparagus out, but I’m not giving up on it yet. We are amateur yard-gardeners, figuring things out as we go. It’s our fourth year of gardening and I had always thought of myself as having a black thumb, but we decided to try it out when we started homeschooling as a part of the curriculum. We chose to emulate the square-foot gardening method as a starting point for our new adventure. It seemed like a good way to go for beginners. This method uses a raised bed, lined with weed cloth, filled with soil and then divided with a grid for separating plants. The system maximizes space to the fullest. Veggies become math problems — 1 foot can equal 1 broccoli or 9 radish or 4 parsley for example. We actually built our garden onto a hill, which was a little tricky but it worked. In our one tiny garden we didn’t end up producing that many vegetables to feed our family of five that first summer, but the kids and I very much enjoyed watching the seeds grow, flower and produce vegetables. My daughter would wait for the sweet peas to ripen then would eat them straight from the vine, and these are kids who usually just push their vegetables around on the plate. We have fallen in love with growing vegetables and herbs. It seems like almost every year we add a new garden. I remember the first time my husband suggested we plant vegetables as a border for our house where other people might plant hedges or bulbs. I was reticent. I had no idea how lovely and welcoming our vegetable bed would become. Sweet potato vines spill over happily into the lawn. Pots of basil, oregano, dill, thyme, mint, sage, and lavender line the garden just as cheerily as any flowers. A trellis of pole beans peeks up from behind. 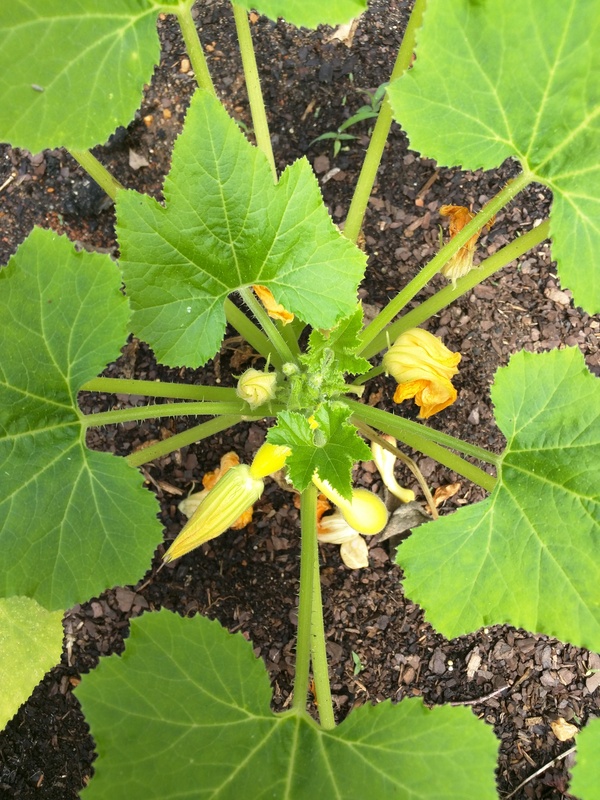 Squash blossoms are little spots of sunshine, promising crooked-necked yellow food that will follow soon. After some success and practice and urging from my husband I felt confident enough that these yard gardens had real curb appeal and didn’t need to hide in the back yard only. For the front, we didn’t raise the gardens, but incorporated them into the yard like flower beds. We dugs the grass and transplanted it to another area of the yard. We tilled the soil, with spades and shovels and sweat, pulling up roots. It took several days but it wasn’t impossible. We mixed in soil and manure. Every year we’d amend the soil a little bit. I’m not sure that we are doing everything right but, even so it seems to work out. Every year we end up with a few more veggies than we had the year before. Now, If you are not foolhardy enough to take shovel and plow to your beautiful yard, there are many other ways to incorporate food gardens into your landscape. Recently I saw the most amazing container garden just on one side of a back porch. A maze of raised beds and pots and trellises were overflowing with tomatoes, cucumber, squash, peppers, herbs and I’m not sure what else. I was astounded by how little dirt and space could produce such massive, healthy plants, and at how pretty vegetables all over a porch could be. When we come up against pests and problems, we just research and troubleshoot each challenge as it comes along. Last year, our cucumbers and squash and zucchini were producing so much that we had to share with friends when suddenly the leaves began to look spotted or chalky and some withered and the crop noticeably slowed down. We diagnosed it as leaf blight and we treated it with a spray of Neem oil, which seemed to help some. I was devastated when an infestation of very hungry caterpillars ate up the dozens of kale plants I had been growing for years. The kale would last through the winter and still be good the next year so I just let it grow and grow. We didn’t want to use pesticides so I tried to pick the caterpillars off and dispose of them one at a time, but I just relented and they got the best of me. I understand that the Neem oil might have worked on the caterpillars as well, but for that season I just had to accept that I grew a stunning crop of butterflies instead. This new growing season has started with its tough lessons before the buds even bloomed. I know a lot of people grow seeds inside first and transplant the seedlings into the garden, but we usually have great success planting the seeds right into our garden. This year though, I was horrified when I accidentally left my seeds out the day before I was going to plant and then a storm blew through and they were all soaked overnight. I planted the soggy seeds immediately and spread out all the others so they could dry, unsure if I could salvage them. I admit I shed some tears over my seeds this year. Most of them grew in spite of the weather tragedy and my fears, but I watched the pepper bed expectantly with no signs of sprouting after several weeks. After I could bear the bare plot no longer, we went to the local co-op and bought some seedlings to plant in their place and they seem to be doing fine. Every year is an exciting experiment. We never feel like we know exactly what we are doing, but it isn’t overwhelming, in fact it brings more joy than I ever could have imagined. And soon enough, when I wonder what’s for dinner I won’t have to jump in my car to see what’s on sale at the grocery. I can step outside and see what’s ripe, if my daughter hasn’t found it first!